There are many geospatial data sets that contain data with coordinates in latitude and longitude in units of degrees. This example illustrates how to import geographic data with coordinates in latitude and longitude, display geographic data in a map display, and customize the display. Geographic vector data can be stored in a variety of different formats including standard file formats such as shapefiles, GPS Exchange (GPX), NetCDF, HDF4, or HDF5 and specific vector data products such as Vector Smart Map Level 0 (VMAP0), and the Global Self-Consistent Hierarchical High-Resolution Geography (GSHHG). This example imports polygon geographic vector data from a shapefile. Vertices in a shapefile can be either in geographic coordinates (latitude and longitude) or in a projected coordinate reference system. Read USA state boundaries from the usasatehi.shp file included with the Mapping Toolbox™ software. The state boundaries are in latitude and longitude. Convert the geostruct array to a geoshape vector and store the results in states. 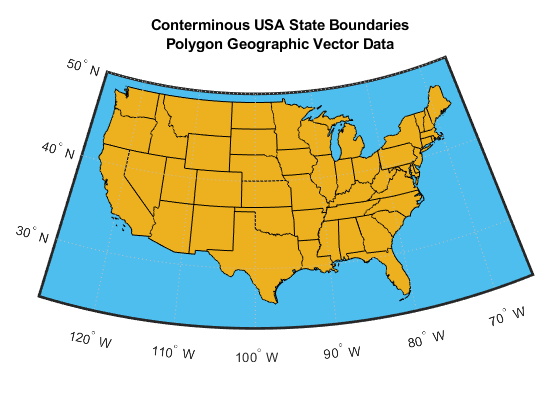 Display the polygon geographic vector data onto a map axes. Since the geographic extent is in the United States, you can use usamap to setup a map axes. Use geoshow to project and display the geographic data onto the map axes. Display an ocean color in the background by setting the frame's face color. 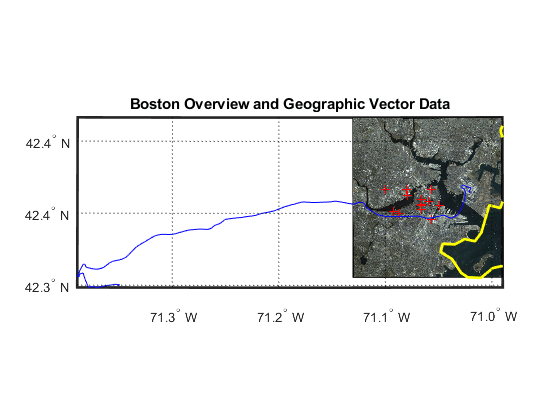 Import point geographic vector data from the boston_placenames.gpx file included with the Mapping Toolbox™ software. 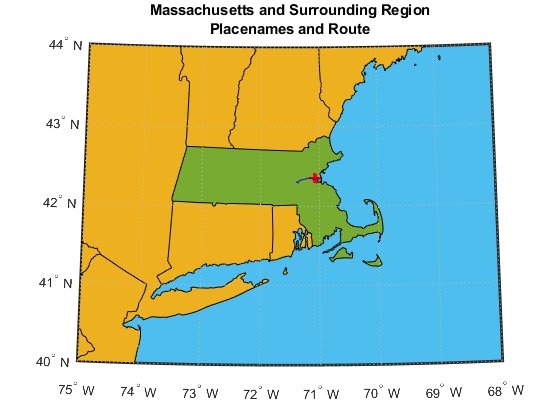 The file contains latitude and longitude coordinates of geographic point features in part of Boston, Massachusetts, USA. Use gpxread to read the GPX file and return a geopoint vector. Import line vector data from the sample_route.gpx file included with the Mapping Toolbox™ software. The file contains latitude and longitude coordinates for a GPS route from Boston Logan International Airport to The MathWorks, Inc in Natick Massachusetts, USA. Use gpxread to read the GPX file and return a geopoint vector. 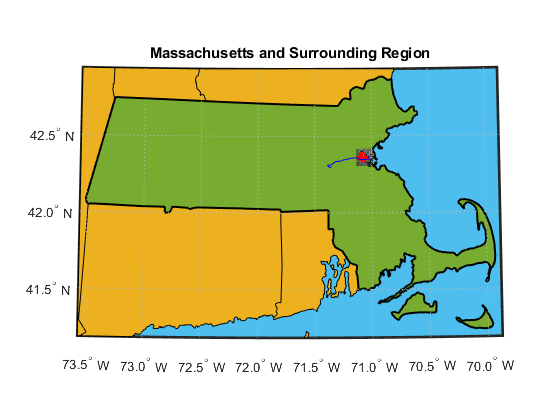 Display the geographic vector data in a map axes centered around the state of Massachusetts, using the data from the state boundaries and the GPX files. The coordinates for all of these data sets are in latitude and longitude. Find the state boundary for Massachusetts. 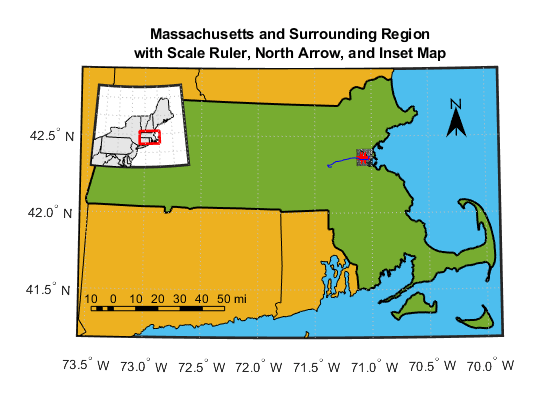 Use usamap to setup a map axes for the region surrounding Massachusetts. Color the ocean by setting the frame's face color. 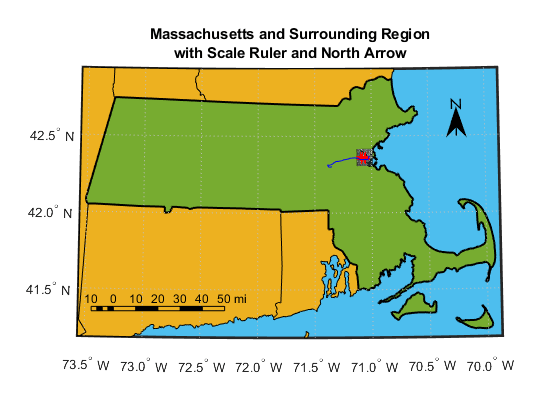 Display the state boundaries and highlight Massachusetts by using geoshow to display the geographic data onto the map axes. Since the GPX route is a set of points stored in a geopoint vector, supply the latitude and longitude coordinates to geoshow to display the route as a line. Zoom into the map by computing new latitude and longitude limits for the map using the extent of the placenames and route data. Extend the limits by .05 degrees. Construct a map axes with the new limits and display the geographic data. Geographic raster data can be stored in a variety of different formats including standard file formats such as GeoTIFF, Spatial Data Transfer Standard (SDTS), NetCDF, HDF4, or HDF5 and specific raster data products such as DTED, GTOPO30, ETOPO, and the USGS 1-degree (3-arc-second) DEM formats. 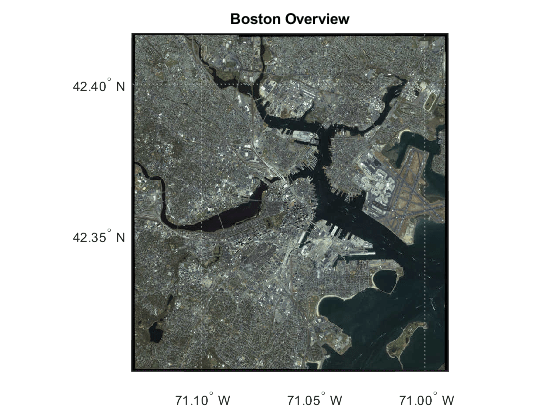 This example imports a raster data file and a worldfile of the region surrounding Boston, Massachusetts. The coordinates of the image are in latitude and longitude. Use imread to read the image and worldfileread to read the worldfile and construct a spatial referencing object. Display the RGB image onto a map axes. The limits of the map are set to the limits defined by the spatial referencing object, R. The coordinates of the data are in latitude and longitude. You can display raster and vector data in a single map display. Since the coordinates for all of these data sets are in latitude and longitude, use geoshow to display them in a single map display. 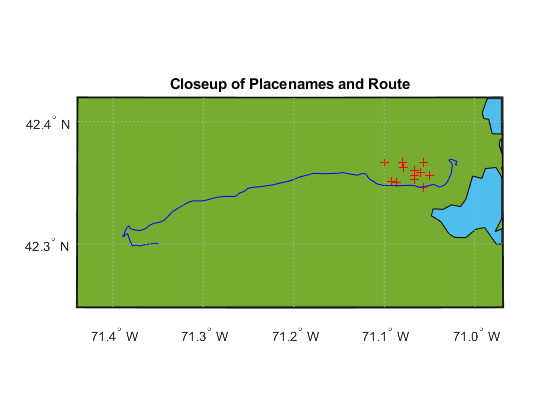 Setup new limits based on the limits of the route, placenames, and the overview image. Customize a map display by including a scale ruler. A scale ruler is a graphic object that shows distances on the ground at the correct size for the projection. This example illustrates how to construct a scale ruler that displays horizontal distances in international miles. 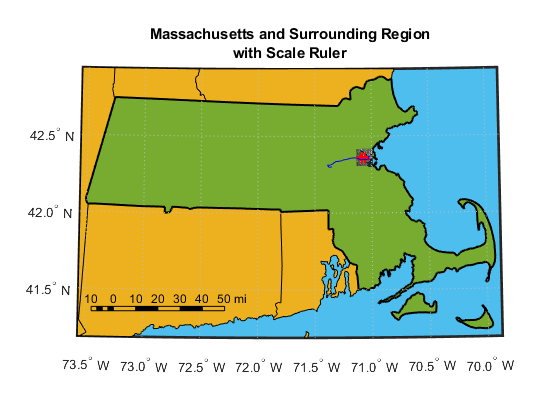 Compute latitude and longitude limits of Massachusetts and extend the limits by .05 degrees by using the bufgeoquad function. Display the state boundary, placenames, route, and overview image onto the map. A location previously chosen is set below. Customize the map by adding a north arrow. A north arrow is a graphic element pointing to the geographic North Pole. Use latitude and longitude values to position the north arrow. Includes material copyrighted by GeoEye, all rights reserved.